This special ends at midnight ET, so don’t delay. Enter Promo Code: CYB2013 at checkout. *Terms and Conditions:This Cyber Monday Promotion (the “Promotion”) begins on December 2, 2013 at 12:01 a.m., Eastern Time (“ET”), and ends on December 3, 2013 at 3:01 a.m., ET (the “Promotion Period”). If you purchase any Constant Contact product(s), excluding SaveLocal and SinglePlatform (the “Product(s)”), during the Promotion Period, you will receive 40% off of all such Product(s) for the first three months after becoming a paying customer. You are eligible to participate in this Promotion if you (i) are a Constant Contact trial account holder or a new Constant Contact customer who has never been a paying Constant Contact customer, and (ii) become a paying Constant Contact customer and either enter the applicable promo code during check out at www.constantcontact.com by 3:01 a.m., ET, on Tuesday, December 3, 2013 or call the Constant Contact Solution Provider you received this offer from and mentioning the offer during their normal business hours during the Promotion Period. After the first three months have ended, you will automatically be charged the current retail price for the Product(s) unless you cancel your accounts or the applicable Product. This Promotion cannot be combined with any other Constant Contact promotion or special offer. 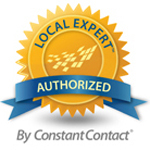 Constant Contact offers a 30-day money-back guarantee on purchases of certain Constant Contact products. Constant Contact reserves the right, in its sole discretion, to suspend or cancel this Promotion at any time. This Promotion and all Constant Contact products and services are subject to the Constant Contact terms and conditions.